Planning an open day? Or sending out a newsletter? The most effective way of communicating with the outside world, be they perspective parents or existing ones is in paper form. With so many sales emails flying in and out of inboxes these days, too many important ones are skipped or often fall into your spam filter. 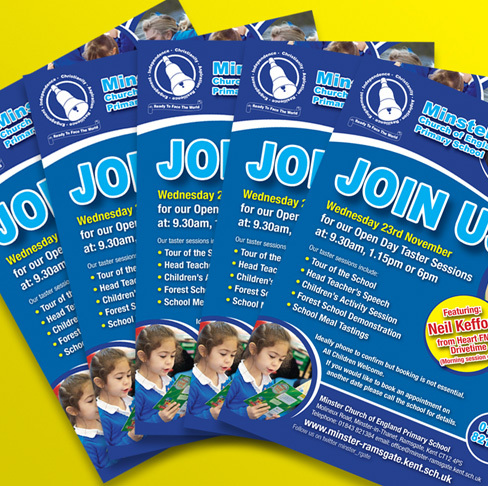 We can design your newsletters/leaflets in house. On approval, you then have a choice of materials to best suit your needs. Anything from a multi-page A4 newsletter, down to a simple single sided A5 leaflet, we definitely have the solution to your problem. Short run and long runs, we cater for all schools large and small. Just call for a price! We are waiting for your call!